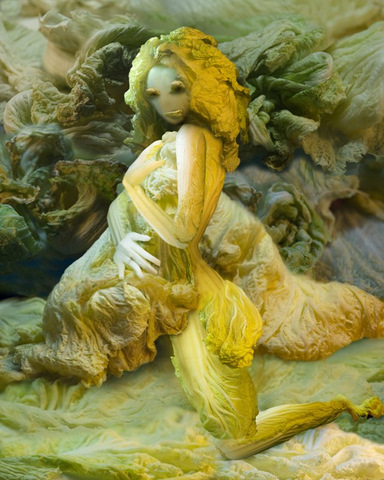 The Fantasies Of Chinese Cabbage, a quirky art project by Ju Duoqi, features sculptures of seductive women that leave little to the imagination. Every part of every sculpture is apparently made entirely from cabbage, including any hats, bags or jewellery. Her sculptures, some of which are modelled on icons such as Lady Gaga and Marilyn Monroe (in the famous subway grating scene from The Seven-Year Itch), are held together with toothpicks. A ‘model’ is pictured lounging on a bed in one sculpture, and suggestively cupping her breasts in another. Ju, from Beijing, uses a knife to slice the different colours and varieties of cabbage and holds them together using toothpicks. The artist has previously used vegetables to re-create paintings by Da Vinci, Van Gogh and Warhol.